Drones have become the ultimate new perspective for many trades, from engineers to farmers, and of course especially to filmmakers and photographers. But how do you know if camera drones are for you? And what's the best beginner drone for you? Professional, and even high-end consumer, drones can cost many hundreds, or even thousands, so are not an impulse buy or a gift. UPDATE: Drone safety has been in the news of late, due to drone use closing down Gatwick Airport in London. If you are going to use a drone, then please head to the website Drone Safe to read up on the rules beforehand. There are, however, plenty of cheap drones which also have the potential to lift your spirits as you gain experience, all while leaving you with some money in the bank should you decide to upgrade to a fully-featured consumer or “prosumer” drone. In terms of gaining experience, the great thing is that the cheaper the drone, the less you get in terms of extra technology, so the closer you are to the experience of flight. That’s good because you can really get to grips with the core controls – the sticks – and then, should you find yourself with a more sophisticated (more automatic) multicopter later on, you’ll be a competent manual pilot already. The two-stick control method is nearly universal; even drones that don’t include controllers will put a touch-based equivalent on your phone screen. There is an arrangement called “Mode 2” which is now near-universal that puts the throttle (up/down) and rotation (yaw) are on the left stick, while the right lets you direct flight (roll & pitch). Didn’t quite take that all in? That’s okay – it’s better to experience it with one of the beginner drones in this guide. As well as “Mode 2,” drones share many characteristics; rechargeable batteries, an even number of rotating props, some form of remote control receiver, and a processor to translate that input into the minor changes in the propeller speed which, in turn, move the craft. For all drones, designers have to make different compromises depending on their goals. Speed and manoeuvrability is important for those who race; size and safety for those who play indoors. Camera quality and drone stability is naturally important for photographers and videographers, as well as flight times. The selection below are all great drones for beginners, but their design goals, and prices, differ. So with everything from a drone that costs the price of a decent camera, down to a drone that costs less than a meal out with your partner, here is our rundown of the best cheap drones on the market today. And if you're dipping your toe in the world of drones, you might be interested in the best dash cams available right now. With GPS so it can hover without drifting, and a mechanically stabilized 12-megapixel camera capable of shooting smooth 1080p HD video, this drone offers real quality in a solid, portable form factor. The thoughtful design includes front-facing collision detection and a natural shield over the most delicate component – the amazing 2-axis camera gimbal. This is designed to travel, and you can even charge it from any USB adapter, like the one with your phone. The Spark uses face and gesture detection so you can have it take off from the palm of your hand, then respond to your gestures: Make a square with your hand and the Spark will take your photo. For more accurate control, operate it from your phone’s wi-fi (around 100m range), or invest in the optional radio controller later for 2km range. The Bebop series are exceptionally durable drones that have solved design issues in innovative ways. The Bebop 2 has recently ceded the spot at the top of Parrot’s range to the excellent Anafi, but that has resulted in some compelling pricing for what is really a hobby grade drone with some exciting accessories. While pros insist on physical gimbals to stabilise video, Parrot have come up with a surprisingly adequate digital equivalent – in low wind at least. By simply taking an ever-moving 1080p crop from a 14-megapixel CMOS sensor using the dual quad-core processors on board, all the weight and mechanics of a gimbal can be removed. You can view a live preview of that video from up to 2Km range (720p) on your phone, small tablet, or the FPV (first person view) glasses. Alongside the standard benefits of GPS making flying easier, some in-built actions are included for one-tap “Dronies” (Orbit, Tornado, Parabola among others, similar to DJI’s “Quickshot” feature). With more than half of the global market, DJI have kept their tech at the top end of the market – even their “cheap” Spark is £449. 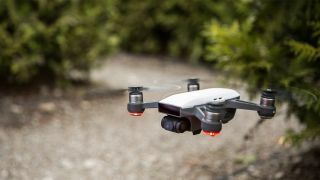 A friendly relationship with neighbouring firm Ryze has led to the Tello, a compact drone that doesn’t skimp on the tech. It beams 720p video back to a phone in WiFi range (100m), or 5mp photos, which are recoded by the App. This data link also provides you a battery warning, and the drone is capable of taking off and hovering using its 14-core processor and in-built sensors. That power makes for fun features like the “Throw & Go” launching and flips, but also supports Scratch, a simple, block-based programming language that means literally anyone (kids included) can have fun ordering the Tello about. Parrot’s Mambo has been around a little while now, but has just kept delivering more thanks to the Lego-like studs for clipping on extras. First came a version with a pellet gun for livening up office warfare. Now an FPV camera which makes it into a mini FPV racer. In all cases build quality is great; the French company essentially started the consumer drone revolution with the AR.Drone and although this is a little pricier than other mini-drones, the quality of the device and the app is impressive. The quad has three flight modes: Easy, Drift and Racing. The first will hover when you release the controls, Drift releases the horizontal stabilization and Racing puts the onus completely on the pilot. This is a great way to learn in steps, and to easy you through the learning curve to becoming Top Gun pilot. Not for the faint-hearted, this drone is as aggressive as its styling suggests. That’s because it’s a racer, an FPV (First Person View) drone built using the popular BetaFlight platform. Racing isn’t easy; the drone won’t help you with taking off and the camera is angled forward (so, at racing speed, it seems level). This is the only way to master FPV racing, the sport of drones. That – we should probably point out– is something Fat Shark have a vested interest in; they are leading manufacturer of FPV goggles, of which a version is included. Worn over the eyes, they close off all but the view from the tip of the flying shark, seen in standard definition but with no lag. It includes 2 ‘2S’ Li-Po batteries, and spare props, access to a simulator on your PC, and has a frankly astonishing acceleration. Beginners need not fear either; there is a self-leveling Beginner mode while “Intermediate” and “Pro” are self-explanatory variants of what racers call “rate mode.” It is the latter which is likely your goal if this drone appeals. This drone introduces not just the experience of flying, but the basic feature set of a serious photography or videography drone for a fraction of the cost. That’s because it includes a GPS positioning system, and control is via a good quality phone app (a phone will clip into the radio controller and serve as a screen). Together this gives higher-end features like ‘follow me’ (the drone will follow the location of the phone) as well as making the drone easy to fly – let go of the controls and the drone will just hover, at the same altitude, even in a breeze. It can also return to its launch point at the touch of a button. The design is clearly inspired by DJI’s Phantom, right up to the 4-light intelligent battery. That said the battery has a Micro USB socket built right in for easy charging - DJI haven’t thought of that yet! On the down-side the camera is not gimbal stabilized, so the drone's vibrations are certainly more than visible in the adequate but gloomy video, and, sadly, it sends back its signal via wi-fi, so it tends to drop out after around 100m, but clean video is recorded to the Micro SD card on the drone nonetheless. Nice touches are the extra landing legs, prop guards and stylish pilot’s manual notebook in the box. This spectacular little ‘copter is ideal for indoor flight since all the props are protected with the almost turbine-like guards. No camera; just human learning to live in harmony with machine. After charging the tiny Li-Po battery using any USB outlet, it is clipped to the bottom. Slightly fiddly, admittedly, but once connected there is the power to whizz around for several minutes and really get to grips with the experience of flight, honing your skills. It also offers a ‘headless’ (easy) mode and a flip function to wow spectators. The controller, powered by 2 AA batteries, has the tell-tale sign of a real pilot’s drone: the left stick does not spring back to the centre vertically on release. That’s because this is the throttle and, in flight, you need to be constantly adjusting this manually to maintain altitude. It’ll come easily enough, and the game-controller shape is natural to hold. The controller does include buttons to ‘trim’ (tweak) the drone’s drift as well as the option to adjust the speed (low rate or high rate). And the price means you can't really go wrong. The design of this drone makes it both portable and very safe, ideal for a bit of fun around the home. The manufacturer calls it ‘crash-proof’ though it’s not that you won’t hit things – more that you needn’t worry about it. It packs a 720p adjustable camera which you can use for live FPV using the iOS/Android app. Indeed, you can control the drone entirely with the app rather than the remote if you choose, just by tilting the phone. You can also record the video the phone receives. If you choose to use it, the controller is powered by 3 AAA batteries, and has influence over the drone at up to 50m (though the wifi video can drop out before then). A very neat touch is the flip-up phone holder. Flying is enhanced with one-touch take off and land, an altitude hold function which makes hovering much easier (you need only compensate for wind drift), and there are pre-programmed flips to wow onlookers too.